The Town of Bethlehem Police Department dispatchers have received numerous calls of bears seen in town so far this year. Many callers have reported the bear was after the bird feeder and/or garbage. Please follow the precautions as noted in the DEC newsletter excerpted below. As New York’s black bears emerge from their winter dens, they need to replenish their nutrients and body fat. Nearly all negative bear encounters in New York are the result of hungry bears being attracted to human food sources, primarily garbage and bird feeders. Bears often find human food readily accessible if homeowners don’t take precautions and these food sources can turn any bear into a problem bear. If you know of bears being fed or of a nuisance bear situation, report to DEC immediately. Take down bird feeders after April 1. Birds don’t need supplemental food in the spring and summer, when natural foods are most abundant. Clean off barbeque grills before nightfall, and if possible, store grills inside. Store garbage in a sealed can inside a secure building or location, and dispose of garbage frequently. Put garbage containers by the curb just before the scheduled pick-up, never the night before. Consider using a certified bear-resistant garbage container. Please report problems with black bears to the Regional Wildlife Offices. 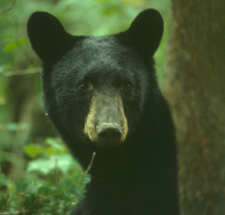 To learn more about New York's black bears, visit the DEC Website. With lengthening days of spring, the whitetail’s body and habits begin to change. Fetal growth advances at a faster rate, taxing does’ bodies of remaining energy stores. Younger deer, whose growth had been suppressed during dormant winter months, is jump started. The increased day length also stimulates antler growth in bucks. These physical changes cause deer to become more active in an attempt to satisfy increasing energy needs. Deer vigorously seek out areas with the first new growth. It’s not uncommon to witness dozens of deer feeding in fields on south facing slopes or in lowlands where direct sunlight has warmed the soil, promoting the growth of tender green shoots. All of this speaks to the importance of providing quality habitat for deer, especially for when winters are prolonged like we’ve experienced this year. 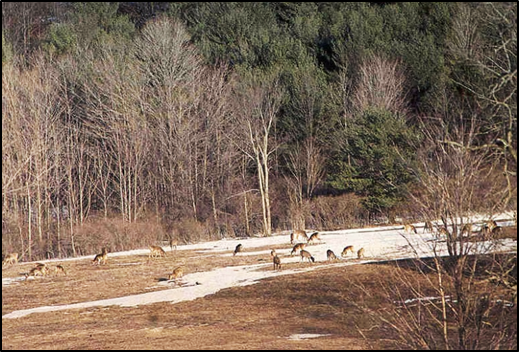 Deer that enter winter in good nutritional condition because of quality summer and fall foods and ample winter cover, are better prepared to survive when snow persists through March and into April. Does that fare well through winter are more likely to birth heavier fawns, which are then more likely to survive and thrive. Bucks that fare well through the winter will get a head start over less healthy bucks and will grow more impressive antlers by the fall. With any luck, the young bucks you passed on during last hunting season are already putting on inches of new antler. To ensure an overall healthy deer population, and to be most successful when you Let Young Bucks Go and Watch Them Grow, consider ways you can improve the quality of the habitat through forest management and creation of young forest.